This Christmas, Pets at Home in Guernsey are running a Santa Paws appeal to help ensure that Guernsey’s abandoned animals aren’t forgotten during the festive season. The Santa Paws Appeal, run with the charity Support Adoption For Pets, collects gifts and donations for homeless animals during the festive season. Now in its eighth year, the team at Pets at Home Guernsey are helping local abandoned animals have a happy Christmas. Last Friday to Sunday the GSPCA were at Pets at Home with GSPCA team members and a few of our teams animals and some from the Shelter. 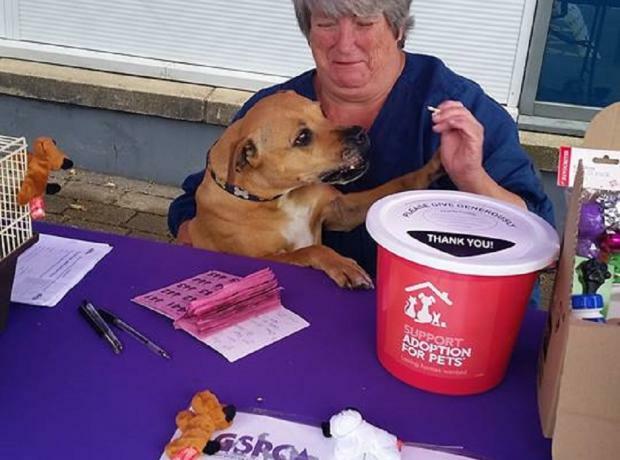 We were helping sell their Scratch Cards for the Support Adoption for Pets Summer Fundraising Drive with the sales of tickets in Guernsey helping the many animals at the GSPCA. Also we had other raffle tickets on sale and even had the Pets at Home Manager locked up in a cage raising funds for the GSPCA. The GSPCA would like to thank all involved and supported for a fun three days raising funds for the many animals at the GSPCA. Over the next three days Friday to Sunday the 29th June to 1st July see the GSPCA each day between 10am and 4pm at Pets at Home with GSPCA team members and a few of our teams animals and some from the Shelter. We will be helping sell their Scratch Cards for the Support Adoption for Pets Summer Fundraising Drive with the sales of tickets in Guernsey helping the many animals at the GSPCA. The logo for the event is ‘SCRATCH PATCH TO WIN’. 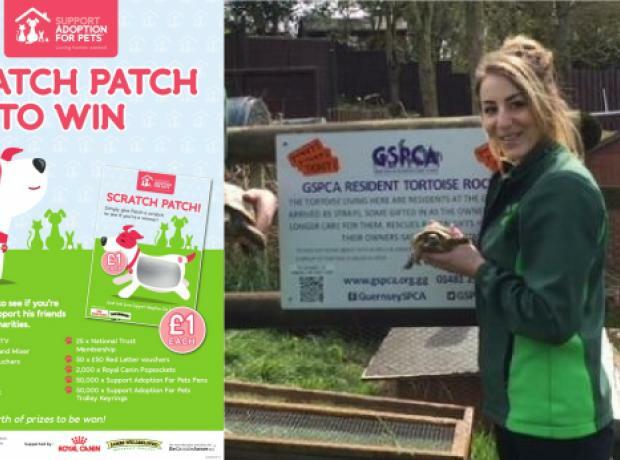 Give Patch a scratch to see if you’re a winner and help support his friends at local pet welfare charities. Last week GSPCA Manager Steve Byrne and the team had a lovely visit from Rory Thorington Store Manager and Nicole Prevel Store Colleague from Guernsey Pets at Home. The visit was to have a tour of the Shelter and to see the many animals in our care and the work that is carried out 24/7 helping over 3000 animals every year. As well as a visit Rory and Nicole had a wonderful gift for the many animals at the GSPCA.